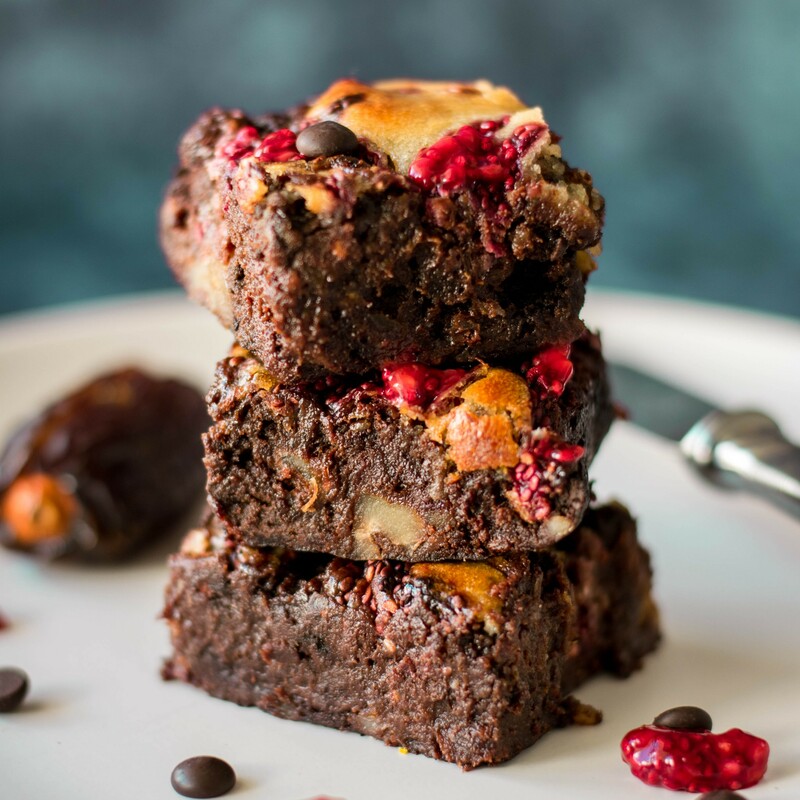 It’s been a while since my last brownie attempts, and while my Walnut Bean Brownies are nothing short of amazing, these beautiful Raspberry Peanut Fudge Brownies take it up another nudge! According to a number of people these are most likely the best brownies I’ve ever created so far. They’re so incredibly fudgy, with a few crunchy walnut pieces on the inside, covered with a fruity and creamy layer on top! The base of these brownies are a mixture of soft ooey-gooey Medjool dates and almonds/walnuts, which makes them super fudgy, deliciously sweet and nutritious. Prepare the raspberry chia jam and place into the fridge. Add the dates, avocado, milk, coconut oil (or nut butter), vanilla extract and salt to a food processor and blend until you get a smooth mixture. 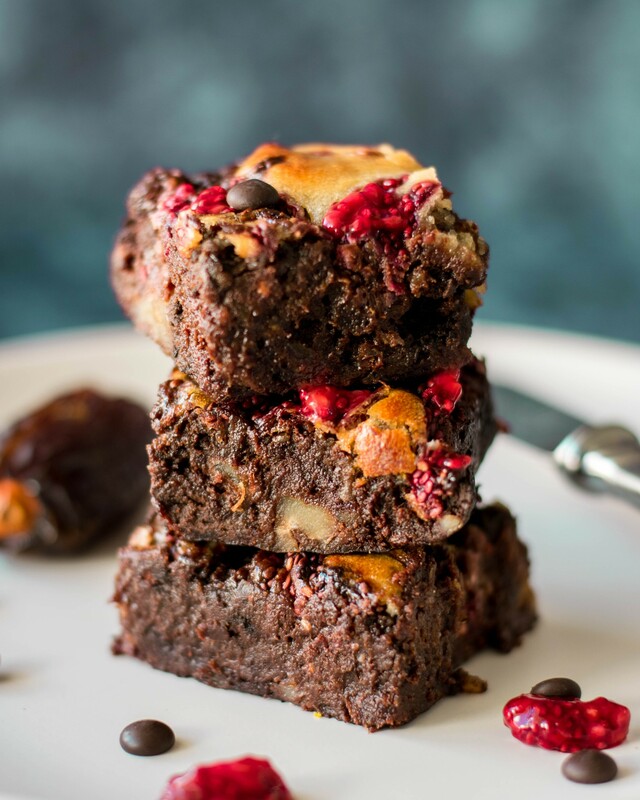 Place the date paste into a bowl and add in cacao powder, almond flour, walnuts, baking powder, and chocolate chips. Use a spatula to mix everything together into a smooth sticky batter. Line a 8" brownie tin with parchment paper and preheat the oven to 175° (350°F). Scoop the batter into the brownies pan and carefully even out (wet the spoon for easier handling of the sticky batter). In a small bowl mix together the ingredient for the peanut butter swirl. 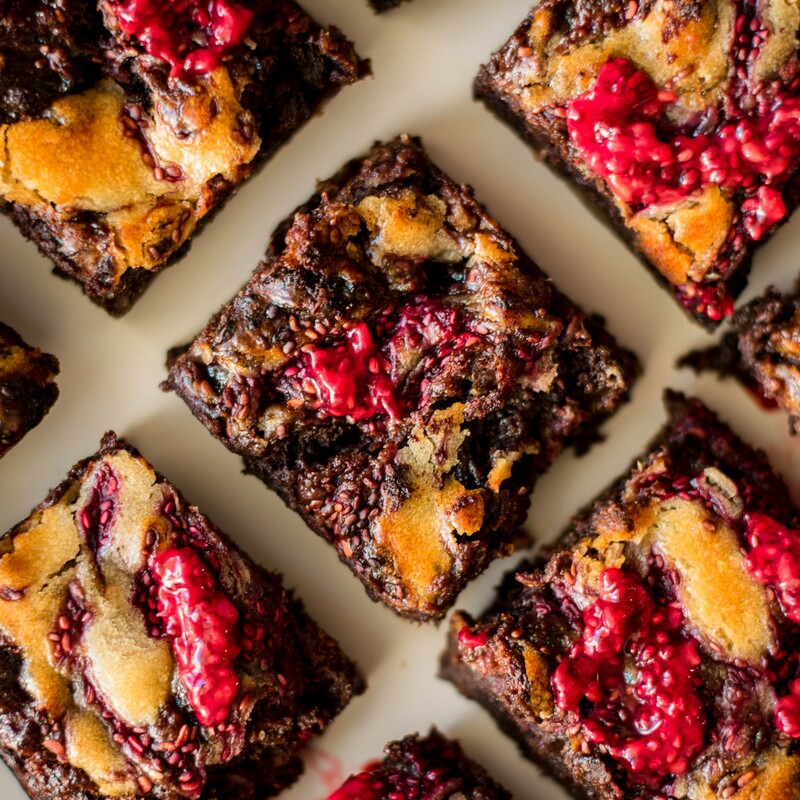 Place a few tsps of the peanut mixture as well as the raspberry chia jam onto the brownies. Use a toothpick to draw swirls into the batter (see video). Place the brownies into the oven and bake for 25 minutes until golden brown on top. Let the brownies cool down completely and place into the fridge for min. 2 hours (best overnight). Take out of the fridge to serve and cut up into pieces.